There are some colour combinations that will forever remain timeless - black and white, purple and pink, red and blue. One pairing that I love is blue and yellow. Because there are so many variations of this combo, it's easy to find a place for them in your home and in every type of room. I love not playing by the rules when it comes to interior decorating. This living room is an example of that - wallpaper on the bottom half of the wall is an unexpected, but brilliant idea. Pairing the navy blue with pops of canary yellow makes this room dynamic and inspirational. 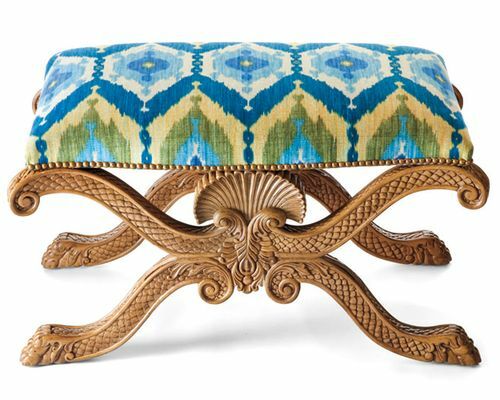 I have been spying (and loving) x-legged benches lately - I see them all the time at Home Sense. Although the ikat fabric is playful and fun, it really ties in well with the seriousness of the ornate detailing on the legs. A navy couch is a timeless addition to any living room. In this room, the sectional artwork and leather club chair screams classic, but the faux fur ottoman, glass coffee table, and pendant floor lamp adds a sense of creativity to this room. Believe it or not, I actually gasped and then ooh'd and aah'd when I saw this dining room online. Isn't it amazing? Every spot in this room that my eyes land on is breathtaking. From the chandelier (how elegant), to the wall colour (beyond luxurious), to the chairs that invite you to take a seat, and to the checkered rug in burnt oranges. This living room is so chic, glam, and girly - a perfect room for any lady who's not afraid of pattern and colour. If you'll notice, this room is mainly white - couch, curtains, lamps, and console table. So, in order to avoid a bland room, adding the yellow mirrors against a bold blue wall, the chairs paired with a duo of patterns, and a trellis rug, the space becomes the perfect spot for a glass of champagne and some girl talk. Have any of you introduced yellow and blue in your home? If so, how did you use it?